Source: Thanks so much to Blaze Publishing for providing me with an e-ARC of this book via Netgalley! 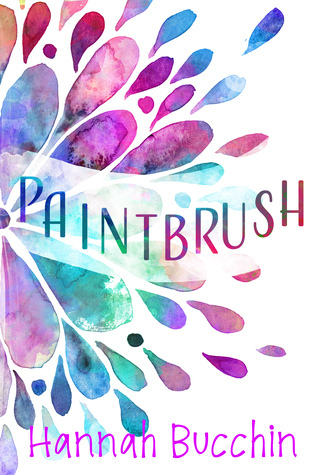 The vibrant paints on the cover of Paintbrush really got my eye when I was browsing Netgalley one day. My natural instinct after seeing such a beautiful cover is to check out the book’s synopsis, so I did. I have to say that I was hooked, and I expected something great. Paintbrush ended up being just mediocre. It wasn’t my favourite story ever, but I’ve read wayyyy worse books. As a girl who devours contemporaries almost 24/7, I was unable to find much originality in this book, which left me feeling bored. To briefly summarize the story, Paintbrush revolves around the dual-POVs of teens Mitchell and Josie. They have never left their community village, but graduation is soon approaching and they still don’t know what they’d like to do with their lives. Mitchell would like to leave and go to college, and Josie wishes to stay in the community she’s always known and treasured. When an adult makes a surprising announcement, the two end up bonding and are forced to rethink all of their decisions. Honestly, I don’t think that books with multiple POVs have been working much for me lately. Since this book had dual-POVs, I simply felt like Josie and Mitchell’s bland personalities were split into half, making then even duller than they already were. I truly cannot assign any traits to either of them- they literally felt like cut-outs of teenage romantic partners. There also wasn’t much of a plot in this story. It’s nothing that the avid contemporary reader hasn’t seen before- enemies turned into lovers figuring out how to handle their relationship after they graduate from high school. I have read too many stories like this, and adding one in without a plot does not make things better. This book did not captivate me at all while reading, nor did it make me want more. It may seem like all I’m doing in this review is complaining, but I do still want to cover the positives about Paintbrush. It’s a fluffy, exuberant, fast read, so if you’re looking for something that will save you from reading dark fantasies and other books of sorts, this one would be great for you. I just read this in the middle of what could be a contemporary binge, so all I really got out of it was clichéness. All in all, Paintbrush did not blow me away like I was hoping it would. I appreciated the light weight of the story, but its characters and plot were underdeveloped. With that being said, I’d recommend this book for those searching for a fast story about a romance that blooms during the senior year of high school. It’s not the most original read, but cute enough to be enjoyed. I love the cover and the premise does seem interesting, when it’s published I’ll see if I can borrow it from the library! I’ll have to read more reviews before I make my final decision.